Wellington’s Linton Brown goes up for two points. 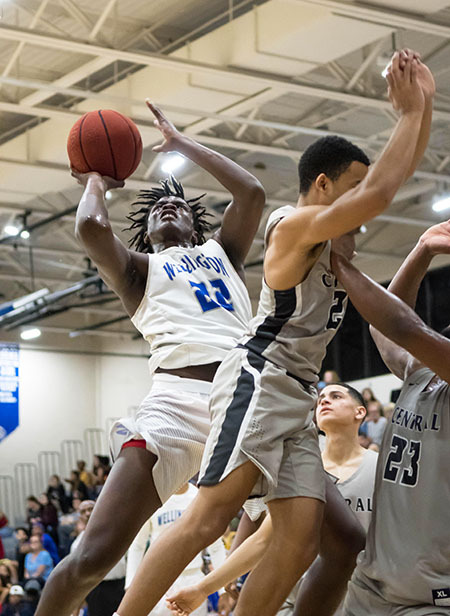 The Wellington High School basketball team avenged an early-season loss to Palm Beach Central High School on Friday, Feb. 1, grabbing a 61-43 victory before a capacity crowd. The Broncos bested the Wolverines earlier in the season for the first time in eight years, but the Wolverines this time played a more consistent game behind senior Linton Brown’s 25 points on the night. Wellington (17-5) found themselves trailing 8-4 most of the first period. Both the Wolverines and Broncos played strong defense, but the Broncos (16-6) had the early advantage. With just over a minute remaining in the first period, the Wolverines were able to tie the game at 8-8 and eventually went up 12-8 in the final seconds to claim the lead. Palm Beach Central was forced to call an early time-out in the second period as Wellington continued with momentum, leading 16-8. The short break was what the Broncos needed to rally to within two, 19-17. Wellington did just enough defensively, winning rebounds and forcing a couple of key turnovers, to let them head into the locker room with a 22-17 halftime lead. Both teams will close out the regular season with non-conference games this week and will prepare to enter post-season play. It is a possibility that fans may see another matchup between the two local rivals in the upcoming district tournament. Wellington’s Brown had the game-high total of 25 points, and Alphonse Alfred recorded 21 points for the Broncos.